Frank Frazetta, the famed fantasy artist best known for bringing characters like Tarzan and Conan the Barbarian to life, has passed away at the age of 82. If you've ever been a fan of Conan the Barbarian, your mental image of him may well have been heavily influenced by one particular person - and I don't mean Arnold Schwarzenegger. 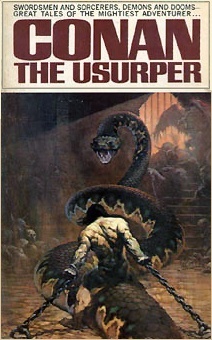 Frank Frazetta brought Robert E. Howard's Cimmerian to life on the covers of paperback novels and movie posters, and his trademark style - with muscle-bound fighters and barely-clad heroines engaged in fierce mortal combat with vicious and terrifying monsters - became hallmarks of fantasy and science fiction art. Yesterday afternoon, Frazetta passed away from a stroke at a hospital near his home in Boca Grande, Florida at the age of 82. Over much of the past year, Frazetta's family had been involved in a dispute over the rights to his artwork, a legal battle that began in July 2009 with the death of Frazetta's wife (and business partner) Eleanor Frazetta, but that had been recently settled. One of the most iconic and talented heroic fantasy artists has left us, and The Escapist extends its condolences to Frazetta's friends and family. May his legacy live on.